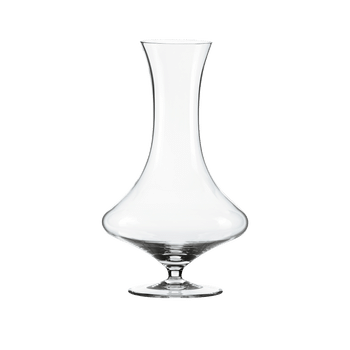 This handmade decanter shares the same elegant form as a harp and is a miniature copy of the iconic Amadeo which was introduced to the market in 2006. The sculpture-like design of the Amadeo Mini is enough to make it a true artwork and a favorite with every wine expert. Six limited-edition mouth-blown Mini Decanters, inspired by the best-selling handmade decanters produced in Kufstein are now available. They have been designed to hold half-bottles of wine. 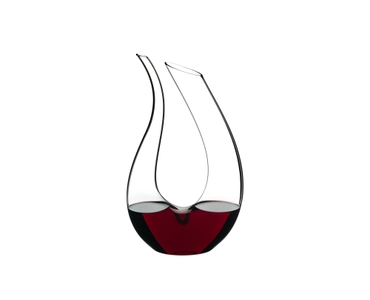 The size is perfect to drink one bottle of wine in two sittings for a perfectly decanted wine each time, and is also ideal for those with less storage. This half-sized Mini Decanter range offers a wonderful alternative to traditional sizes designed for larger bottles. Every piece is unique, made by hand and mouth-blown from crystal glass. RIEDEL whole-heartedly believes all wines - young and old, red, white or sparkling - can be enhanced by decanting. RIEDEL tip: use bottle cleaners to remove stains inside the decanter.